Unfortunately, age discrimination is a reason for many unlawful termination and layoff cases. Though an employer may cite financial reasons for company layoffs, often the employees let go are older workers. If you believe the reason behind your job loss is due to age discrimination, it is important to quickly seek legal advice. Rob represent workers, executives, and professionals throughout Georgia who have experienced age discrimination or harassment. Contact Rob to speak with an employment lawyer about your specific situation. The Age Discrimination in Employment Act (ADEA) protects employees who are at least 40 years old and work for an employer with at least 20 employees. The ADEA makes it unlawful for an employer to make job-related decisions because of your age. If you were selected for layoff, but younger employees with less experience were kept on, you may be a victim of age discrimination. Biased comments These are the most obvious signs, but are usually rare. If your boss calls you “old man,” asks you about your retirement plans, refers to seeking “new blood,” or says that your best days are behind you — document it. This could be considered direct evidence of discrimination. If there are any witnesses, write down their names. Note dates, times and places. Comparisons Pay attention to how younger employees are treated. If they are treated differently than you or other older employees under the same circumstances, that could be evidence of age discrimination.Similarly, if older employees were the primary targets of a lay off, start writing down their names, along with the names of younger, less-qualified employees who were kept on. Disparate discipline If you’re disciplined for something that younger employees do without consequences, write it down. If you are placed on a Performance Improvement Plan (PIP), you should be on guard. Your employer might be using the PIP or a discipline record to build a case for terminating you. Your employer has an H.R. Department guiding them. You should call a lawyer. Promotions If you’re more qualified than a younger employee, but you’re not chosen for a promotion that you applied for, it might be due to your age. Favoritism If younger employees are given the best assignments, this could be a sign of age discrimination. Additionally, if older employees are excluded from key meetings, or if the boss only socializes with younger employees, then these too may be signs of age discrimination. Hiring younger employees If you see a pattern of your company hiring only younger employees, or if you are turned down for a position that you apply for and see it given to a less-qualified younger employee, it may be a sign that the company is discriminating due to age. Suddenly stupid Does the attitude at work change after you hit an age milestone? Or does a new boss only like younger employees? If you turn, say, 50 or 60 and suddenly get negative performance reviews and write-ups, you might have an age discrimination claim. Harassment If you think your boss is trying to make you miserable due to your age to try to get you to quit, or if you’re being called names and made fun of because of your age, start writing it down. This could be harassment due to your age. But the boss is older Even if the boss is your age or older, if they prefer younger employees over older ones, it still might be age discrimination. WHAT TO DO IF YOU'RE BEING SUBJECTED TO AGE DISCRIMINATION. 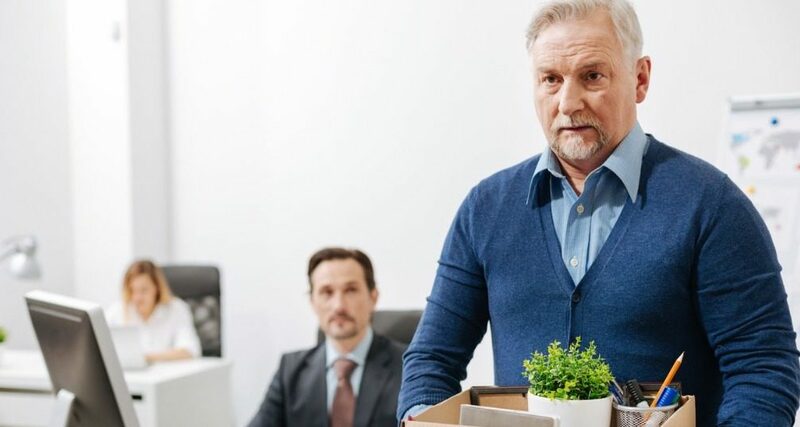 If the company hands you a severance agreement and you think you’ve been targeted for layoff due to your age, contact an experienced employment lawyer like Rob. He might be able to negotiate a better severance package for you. Plus you might be giving up rights that you don’t need to sign away. Always read and understand any agreement before you sign. If your employer takes an adverse employment action, like denial of a promotion, a demotion, suspension without pay, or termination/layoff, because of your age, you should contact an employment attorney. While you will need to file a charge of discrimination with the EEOC before you can sue, you are usually better off consulting an attorney before doing so. If you’re being harassed because of your age, then you will need to report the harassment to your employer. Before doing so, it might be smart to consult with an employment attorney. Rob can help you navigate the complaint process and if your employer fails to stop the harassment, help you take further action. In Georgia, you have 180 days from the date of discrimination to file with the EEOC. Don’t miss your deadline! This is a requirement before you’re allowed to sue. Contact a Georgia age discrimination lawyer like Rob today to protect your rights.